The conspicuous colors of poison frogs are presumed to be a warning. Indeed, vibrant patterns so often signal toxicity that biologists even have a special term for them: aposematic coloration. But, weird as it might sound, new research suggests that radiant skin patterns might help these frogs stay hidden, too. Poison frogs are armed with some of the planet’s most potent toxins. The most deadly is the golden poison frog (Phyllobates terribilis)—one frog’s worth of toxin is roughly enough to kill 10,000 mice or about 10 people, though estimates vary. It makes sense for it and other frogs to let potential predators know that eating them is a bad idea, and most do seem to advertise their toxic nature through bright, colorful patterns. 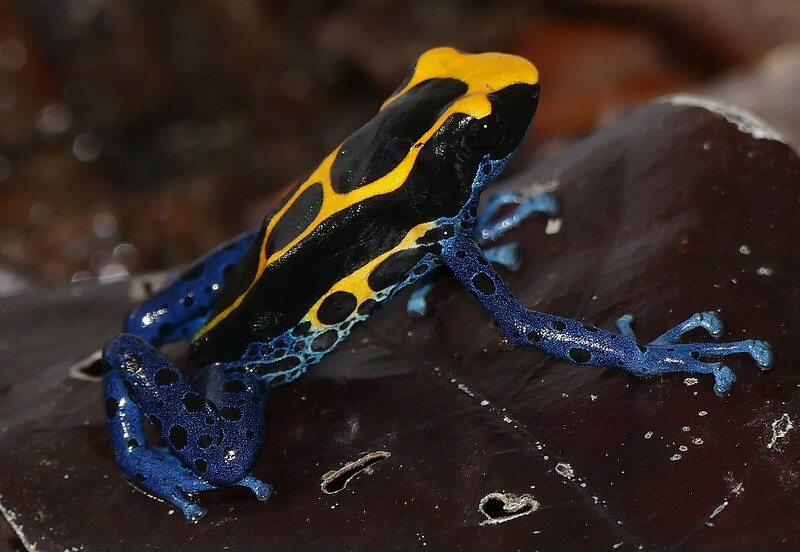 The dyeing poison frog (Dendrobates tinctorius) is no exception: its legs are a brilliant blue with black spots, while its back has swirls of bright yellow. It seems counterintuitive at best that such vivid patterns could serve as camouflage, but that’s exactly what researchers from the University of Bristol found in their study. First, they took pictures of the frogs in their natural habitat in French Guiana, and then tried to “spot” the frogs using computer models of different animal visual systems. In their models, the frogs were easy to spot close up. But as the simulated eyes moved further away, the patterns started to blend into the background. But computers aren’t perfect, so they continued with two studies that tested real eyes. In the first, plastic frogs were placed in the wild on one of four backgrounds—leaf litter, a photo of leaf litter, natural soil, and a colored paper square. The fake frogs were either pattered yellow and black, all yellow, or a completely cryptic brown and black. Both the frog’s natural coloration and the designed cryptic patterns lessened the rate at which the faux frogs were attacked by birds, but only when on the leafy backgrounds. It’s not hard to imagine how these little frogs become harder to see as you move further away, even with their bright colors. Photo by Travis S.
They also had people try to spot different frog patterns. Images of frogs with the generated natural and unnatural patterns were placed on photos of leaf litter randomly, and scaled for three detection distances. Since participants had to click on the frog, the researchers could clock how long it took them to find it as well as the spotter’s accuracy. 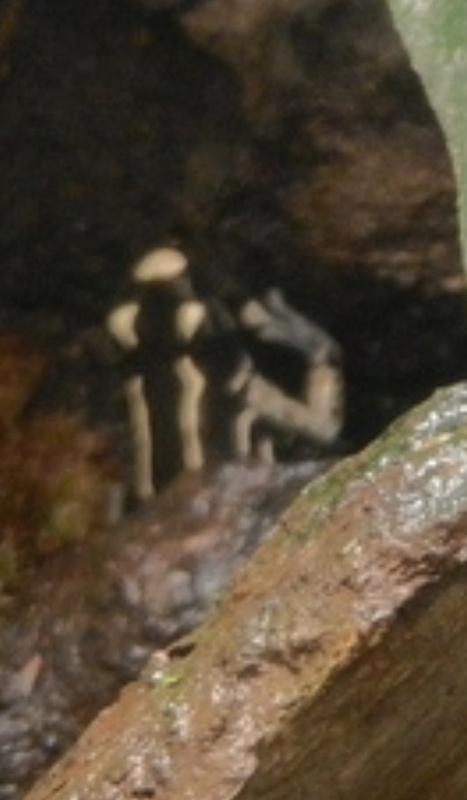 And they found that up close, it was easy for people to spot the yellow and black frogs. But they were harder and harder to see with distance, becoming as hard to distinguish as intuitively camouflaging patterns. 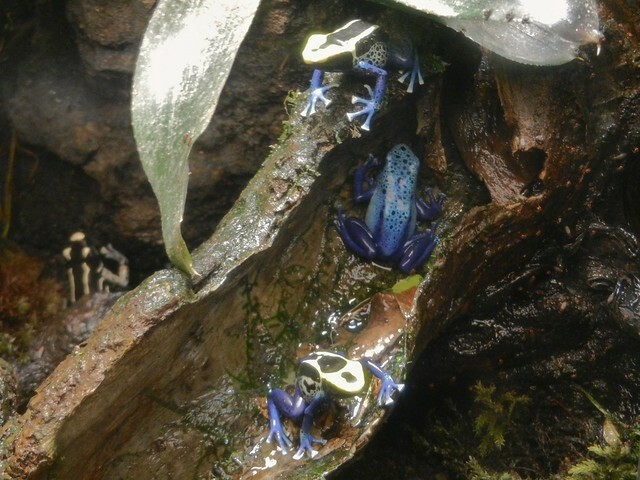 They think what’s happening is that because the frogs use colors that aren’t present in the background—those bright yellows and blues—they stand out if you’re near enough to see them. But as your eyes move further away, the colors start to blend together, and the frogs’ average color is basically the same brown as the leaf litter they hang out on. Further research will be needed to see if aspects like lighting also play a role, as well as whether other species, especially other toxic ones, have evolved similar ‘distance-dependent coloration’. But the implications of such research stretch well beyond understanding frogs—as one co-author pointed out, these data could help design better camouflage patterns for our uses, like for use by the military. Added bonus: our troops would look so much more impressive if they were decked to the nines in poison frog patterns. Maybe they could ask María Escoté to design the new uniforms!